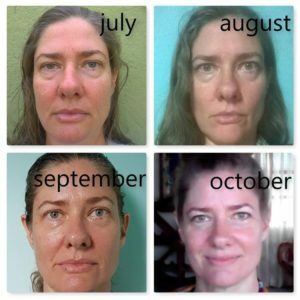 Face Yoga : How long does it take to see results? It seems such a cop-out to respond, “Well, everyone is different,” and thank the universe we are, but it doesn’t help when we’re looking in the mirror and not liking what we see. We live in a quick-fix world, and if that’s what you’re seeking (and have the money to blow on treatments and procedures) Face Yoga probably isn’t for you. And that’s OK. But back to the question at hand. Ahem. 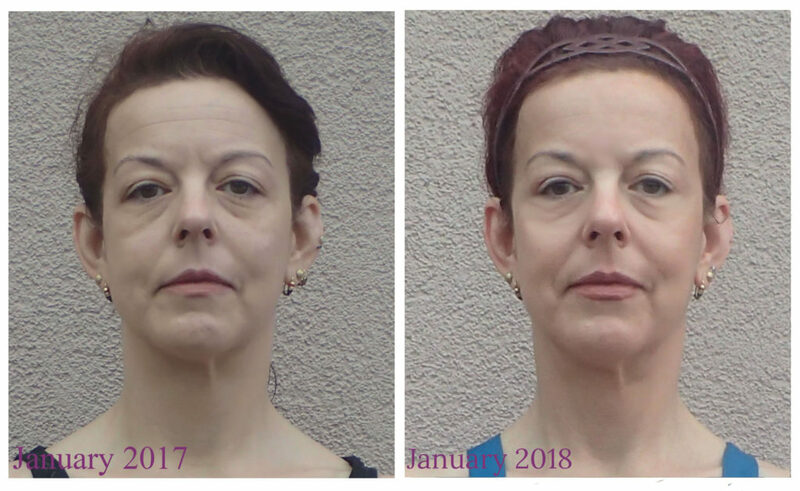 With regular practice of at least 5 minutes per day focusing on the area(s) they want to improve, some people will see results within two weeks. The operative words here are “with regular practice.” Translation. It needs to become a habit. I usually recommend to practice in the morning to energize and get in tune with your daily facial movements, then again in the evening to relax, rewind and get a better night’s sleep. Stress can make us frown even in our sleep. Not to mention how we contort and mush up our faces tossing and turning or depending on our sleep position. But that’s a subject for another blog. Add in an afternoon practice for a little pick me up, like a coffee break, but hold the coffee. Drink (hot) water instead. And if you can do a full 5 to 20 minutes, or more, at a time, go for it. Many students practice in the car, in bed, in the shower, while cooking, cleaning or walking the dog, and, yes, even every time they go to the bathroom! The list goes on. Banish the words “I have to” and “I should.” Just do it. Make faces. Be a kid again. Enjoy it. The key is to practice daily. Your commitment will help you find those moments. After a month or so, what seemed like it took discipline becomes less of an effort, and,Voila! 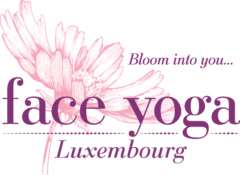 Face Yoga becomes a part of your lifestyle. The positive, physical changes come from you. Your resolution. Your realistic goals. Your efforts. How do you think you will feel when you look in the mirror then? So doing the exercises is one thing. The happy, confident feeling that comes with it is another. The time it takes will be as unique as you are. Previous Previous post: Welcome to my blog! May 4, 2019 in Capellen. Click here for more information.